With the visit of Japanese Prime Minister Shinzo Abe to Russia for a summit with President Vladimir Putin expected in April, Russia and Japan continue to have unsolved questions regarding their relationship. Masahiro Akiyama, Chairman of the Society of Security and Diplomatic Policy Studies (SSDP) told valdaiclub.com about the prospects of resolving past issues and moving forward. “I don't think the Russia-Japan 2+2 meeting could bring a breakthrough in the sovereignty issue soon, but if it develops as a full-fledged and substantial process, it will at least take the bilateral relations to a new level,” Akiyama told valdaiclub.com. Akiyama noted that while Shinzo Abe has been criticized for frequent visits to Russia that yield little progress on Japan’s island issue, it still creates hope for Abe to resolve the issues. 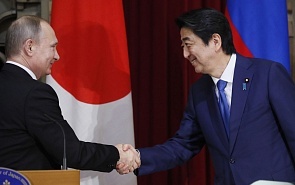 Akiyama added that the same could be said about the recent Putin-Abe meeting in Mainland Japan. “Earlier this month, we witnessed discussions on the possibility of joint economic activities on the disputed islands. It has seemingly pulled back people of Japan to realize the reality, but again with hope and expectation of return of Russia-held islands together with the signing of the peace treaty,” Akiyama told valdaiclub.com. “From the same realistic viewpoint, the two-plus-two meeting held in March in Tokyo sounds as a positive development in the bilateral diplomatic activities. Experts in Japan stress the importance of the two-plus-two meeting as it engages so much in the national core interests and national security as in the case that Japan and the US successfully strengthened the alliance in 1990's by launching a 2+2 ministerial meeting,” Akiyama concluded.